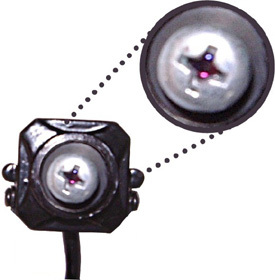 This small, pinhole camera has a screw shaped lens, making it ideal for covert surveillance operations. The camera weighs approximately 40g, including power, video and audio connectors. The camera can be powered from the mains supply or battery (clip supplied) and will output both video and audio.